What we tested: Three varieties -- penne, elbow macaroni, and spaghetti -- all cooked al dente. Servings per container: While the nutritional panels stated the boxes contained "about 7 servings," we found that they contained closer to 6 servings. What does this mean? Simply dividing the box into portions according to the approximate "servings per container" won't necessarily give you the correct serving size. Cooked measurements: We got down to it and found that a single 2-oz. serving of the dry penne cooked up to a heaping cup. Both the cooked spaghetti and the elbow mac measured in at a scant cup per serving. Dry measurements: Wanna cook up a single serving of pasta but don't feel like busting out the food scale? A 2-oz. serving of uncooked elbow macaroni comes to just shy of 1/2 cup. The same amount of dry penne measures in at a little more than 1/2 cup. Good to know! There's no easy cup measurement for uncooked spaghetti, but there are some cool measuring tools out there! 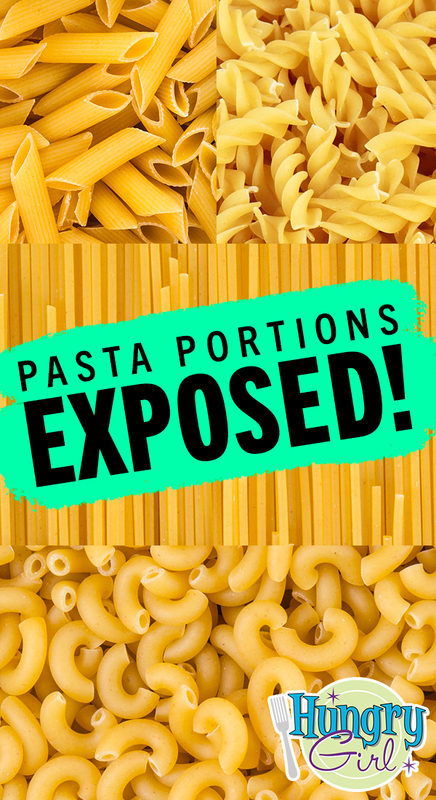 Bottom line: Pasta generally doubles in size when it cooks, and a cup of cooked pasta is a good ballpark for a single serving size! Hungry for Healthy Pasta Recipes? Pasta power! FYI: We may receive compensation from some of these links. It’s November 14th, National Pickle Day. Celebrate with a batch of these Faux-Fried Pickle Chips… made in an air fryer or an oven! Fact: Everyone loves pasta. Conclusion: Everyone will love you once you click "Send to a Friend!"